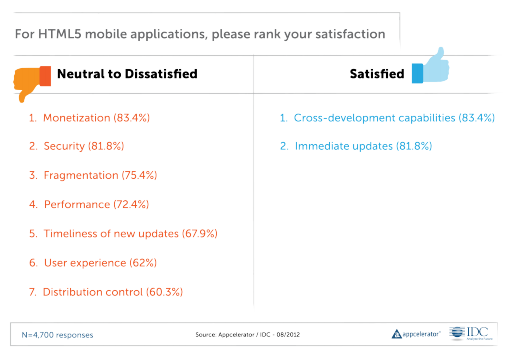 Even as Android has blown past iOS in terms of total device activations versus Apple’s cumulative device sales, developers still remain more interested in building for iOS, Appcelerator found in a survey of more than 5,500 developers. This could be either because Apple’s iOS continues to monetize better than Android or because there is a lag time. It may take many more months (or years) before developers adjust to understanding that Android likely has a larger active installed base of devices. The Blackberry platform showed a far more precipitous decline, but the reasons for that are far less puzzling. 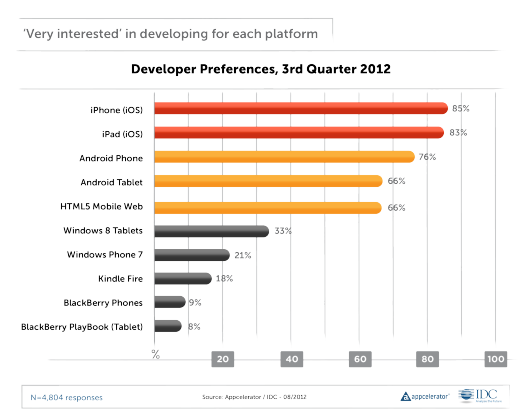 Appcelerator found that the platform features developers were most interested in included Apple Maps (hah! ), followed by the mobile wallet Passbook and then standard upgrades like a faster processor. 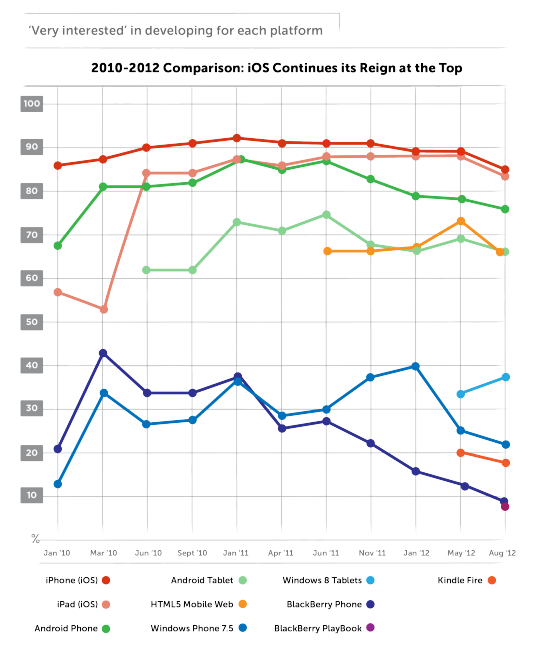 Naturally, Apple holds a much stronger lead in the tablet category with the iPad, than it does in smartphones. Apple said it had 68 percent market share from April through June in the tablet category, during the iPhone 5 launch event. The irony of the split between Android and iOS developer interest is that developers told Appcelerator that the most important factor for them in determining which platform to build for is having a “large installed base of devices.” While no one knows the exact active installed base of devices, the number of daily active users that Facebook’s Android app sees recently surpassed Facebook’s iOS app. On top of that, Android head Andy Rubin said that the platform had seen 500 million activations, while Apple last said it had seen 400 million in cumulative device sales. As for cross-platform development, developers remain deeply dissatisfied with HTML5 — mostly because of monetization and security issues. And it looks like those won’t be solved anytime soon, especially given that Facebook has now reversed course and is shifting away from HTML5 toward native development. With nearly 1 billion users and a rich ecosystem of developers, they would have been one of the companies that would have been most able to support payments and monetization on the web. Apple, Amazon and Google, meanwhile, are all putting resources behind their own app stores. 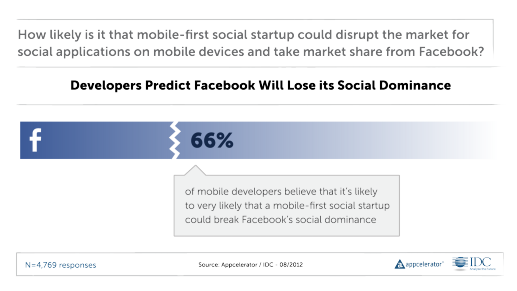 Speaking of Facebook, two-thirds of developers think that a mobile-first startup could disrupt the social networking company’s hold on the entire marketplace. One big piece of evidence in support of this has been Instagram’s quick run to accumulate more than 100 million users, attracting enough momentum to force Facebook’s hand with a near $1 billion acquisition. Facebook CEO Mark Zuckerberg really tried to emphasize how mobile has become the company’s top priority at TechCrunch Disrupt earlier this month. He said in the last six months, the company had overhauled its native applications, added a mobile revenue stream in the form of advertising and launched a deep integration into iOS6 with Apple. Yet that may not be enough. Perhaps it’s only a matter of time before someone emerges that won’t cave in the face of a $1 billion offer (not unlike how Zuckerberg turned down Yahoo five years ago). 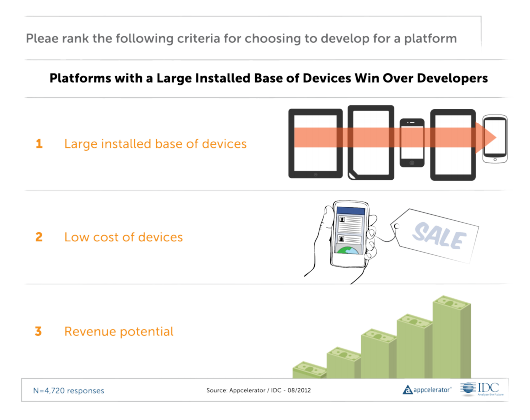 Lastly, developers see smart TVs as the most likely candidate for the next big platform, followed by connected cars and then game consoles. 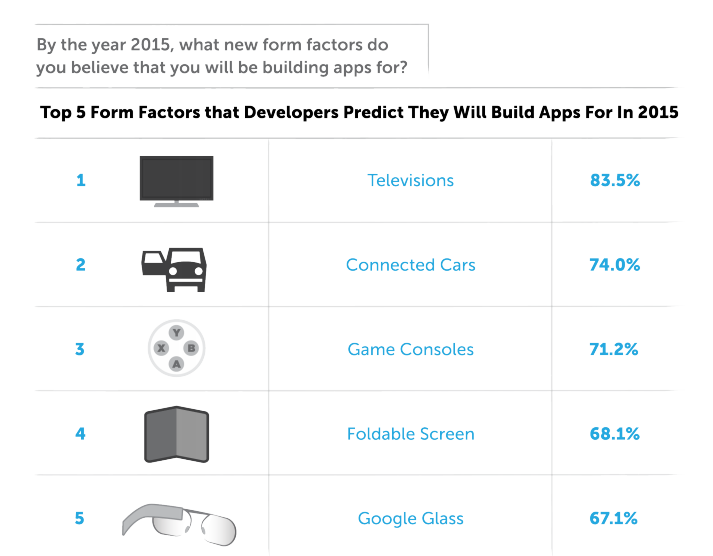 Wearable computing, like Google Glass, comes in at fifth place with two-thirds of developers saying they’d be willing to build apps for by 2015.